This brass and silver instrument created in France in the late 17th to early 18th century was used for calibrating and making sundials. This portable sundial is one in a small collection gifted to the Metropolitan Museum of Art in the early 1900s by Mrs. Stephen D. Tucker in her husband’s honor. Though the creation of this particular instrument seems to overlap with a period when watch and clockmaking was rapidly developing in Europe, “advances in clockmaking during the seventeenth and eighteenth centuries actually spurred interest in sundials” (Chandler and Vincent, 1967: 154). This portable instrument would have been used to calibrate other dials, as well as to set and regulate clocks to determine time. When used outdoors, the pointer (also called a style or gnomon) casts a shadow on the calibrated surface, revealing the time of day. This particular style may be adjusted for use from latitude 40 to 50 degrees (metmuseum.org) and has multiple hour rings (Chandler and Vincent, 1967). It is crafted of brass and inlaid with silver in elaborate, swirling leaf designs. Though its striking design makes it valuable as a work of art, its function as a portable sundial and calibrating tool make it useful for determining latitude and calculating the time. According to Chandler and Vincent, the portable sundial is a marker in the history of sundials of “attempts to achieve ever greater accuracy” (Chandler and Vincent, 1967: 155). Additionally, this object demonstrates the prevalence of the class of portable dial known as a “Butterfield” dial, named for Michael Butterfield, an Englishman credited with designing this type of horizontal sundial while working in Paris between 1678 and 1727 (Chandler and Vincent, 1967; Higton, 2002). This portable instrument is fashioned with bird-shaped supports, with the beak of the bird sliding along the time scale engraved on the style (pointer) to indicate “the angle appropriate to the use of the dial in a given latitude” (Vincent, 1987). Butterfield’s design became the standard for French sundials at this time, and the sheer existence of this calibrator indicates the dominance of the Butterfield dial (Chandler and Vincent, 1967; Higton 2002). Though this portable sundial and calibrator is not signed by its maker, it is discussed in Nicolas Bion’s famous treatise Traite de la Construction et des Pricipaux Usages des Instruments de Mathematique, first published in 1708, which is an indicator of its importance as a mathematical object at the time. Bion’s work was translated into English in 1723 by Edmund Stone and provides directions on how to use this calibrator, including a diagram with each piece labeled. Part of the instructions reads, “About the center (A) is drawn an horizontal dial upon the upper plate, for the latitude of the place it is to be used in, and the axis (B) is so adjusted, that the point thereof terminates in the center (A), wherein a small hole is made for a thread to come thro. There is also a compass (D) fastened to this upper plate, having a line in the bottom of the box, [showing] the variation of the needle” (Bion and Edmund, 1723: 236). According to Vincent (1987), this portable dial is not a “true Butterfield” since it can also be used to draw the hour lines of a sundial on any flat surface (62). It is also possible this portable dial was one element of a set of instruments and could have been separated from the piece that was signed by its maker (Vincent, 1987). The combination portable sundial and instrument for calibrating sundials was created in France some time between 1690 and 1710. It is unknown who owned this instrument before Mrs. Stephen D. Tucker gifted it to the Metropolitan Museum of Art in 1903. In 1967, this object was featured in a special exhibit of the sundials in the Tucker collection (Chandler and Vincent, 1967). (2013). Time for everyone: The origins, evolution, and future of public time. NAWCC Ward Francillon Time Symposium, 7–9 November 2013. Bion, N., & Stone, E. (1723). The construction and principal uses of mathematical instruments. London: H.W. for John Senex. This source was an exciting one to find on this subject. Since the original French version of this text was published in 1708, it is possible that its discussion of the portable sundial instrument can help to narrow down the date range during which it is thought to be created. Bion’s work (and Stone’s translation) provides detailed directions for utilizing this calibrating instrument, which was difficult information to find among descriptions of sundials and their uses. Chandler, B., & Vincent, C. (1967). A sure reckoning: Sundials of the 17th and 18th centuries. The Metropolitan Museum of Art Bulletin, 26(4), 154–169. This piece within the Met Bulletin provided a wealth of information about this object. Though some of the information is available on the Met’s website, it listed the provenance, the material, and historic background on sundials created in Europe and how this instrument would have fit into the larger picture. Flechon, D. (2011). The mastery of time (pp. 104–115). Paris: Flammarion. Higton, H. (2002). Sundials at Greenwich: A catalogue of the sundials, nocturnals and horary quadrants in the National Maritime Museum, Greenwich (pp. v, 57, 88–89, 439). Oxford: Oxford University Press. Lennox-Boyd, M. (2006). Sundials: history, art, people, science (pp. 48–85). London: Frances Lincoln Ltd. This is an exhaustive history of the sundial. It provided a lot of information about instruments created in Europe during the late 17th to early 18th century, but also about sundials in other contexts. Milham, W. I. (1923). Time & timekeepers: The history, construction, care, and accuracy of clocks and watches. New York: The Macmillan Company. Parker, J., Zrebiec, A. M., McNab, J., Corbeiller, C. Le, & Vincent, C. (1989). French decorative arts during the reign of Louis XIV 1654–1715. The Metropolitan Museum of Art Bulletin, Spring. Vincent, C. (1972). 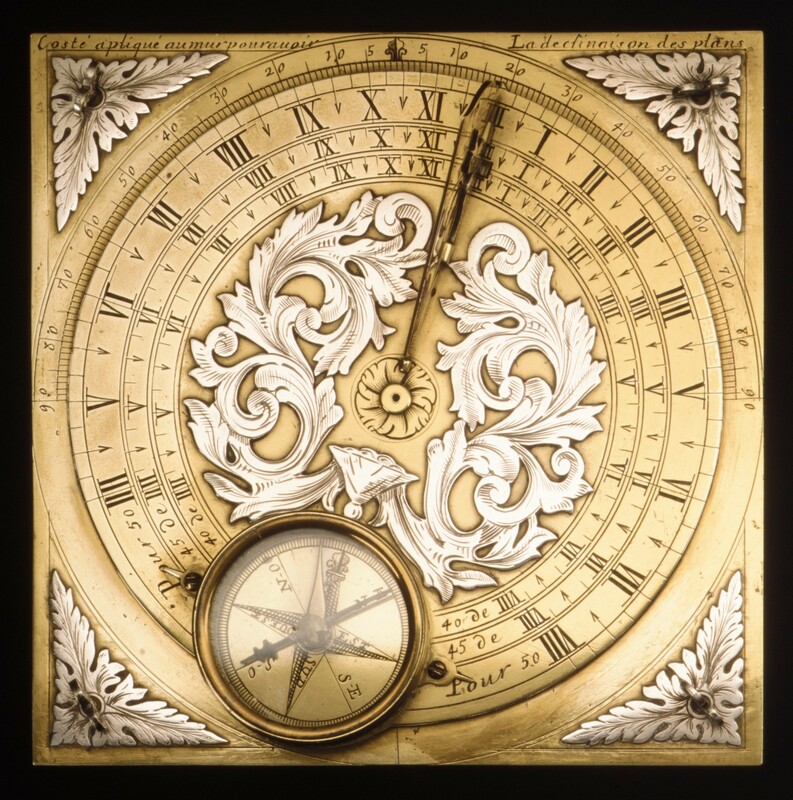 Magnificent timekeepers: An exhibition of northern European clocks in New York Collections. The Metropolitan Museum of Art Bulletin, New Series, 30(4), 154–165. Vincent, C., & Chandler, B. (1969). Nighttime and Easter time: The rotations of the sun, the moon, and the Little Bear in Renaissance time reckoning. The Metropolitan Museum of Art Bulletin, 27(8), 372–384. Scientific publications editor and archivist at the American Museum of Natural History with a Master of Science in Library and Information Science from Pratt Institute. New York City enthusiast.